We thought CPU delidding was serious business, but researchers at the Georgia Institute of Technology have just taken CPU cooling a step further. 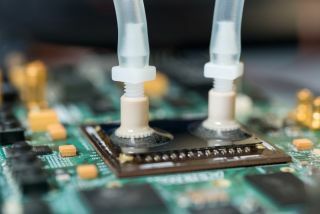 They're looking to make big water cooling blocks a thing of the past by moving liquid cooling directly onto the chip. Associate professor Muhannad Bakir along with graduate student Thomas Sarvey removed the heat sink and heat-spreading materials from an Altera field-programmable gate array (FPGA) chip. Then, they "etched cooling passages into the silicon, incorporating silicon cylinders approximately 100 microns in diameter to improve heat transmission into the liquid. A silicon layer was then placed over the flow passages, and ports were attached for the connection of water tubes." By feeding 20 degree Celsius water into the tubes at a rate of 147 ml per minute, the chip operated at a temperature of less than 24 degrees Celsius, while a normal air-cooled model would operate at around 60 degrees. Bakir said that the same technology could be applied to CPUs and GPUs. What this means is that we could be seeing denser and more powerful systems in the future, given how much less space this sort of liquid cooling would take up compared with current cooling solutions. Thanks to PCPer for the tip.